The lizard-like creatures infected by the virus appear in the artwork of Tour Bus To Forbidden Realms and Shared Ride. 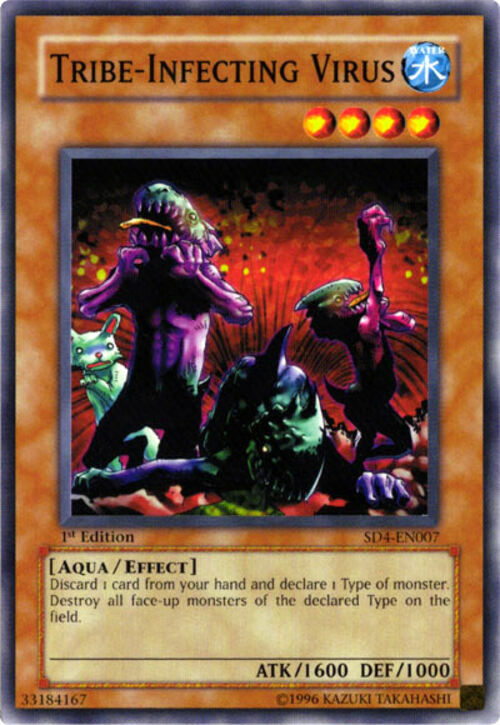 This card doesn't show the virus itself, but the affected monsters. Yu-Gi-Oh! Nightmare Troubadour and later video games show the virus as an orange swirling circle of haze. 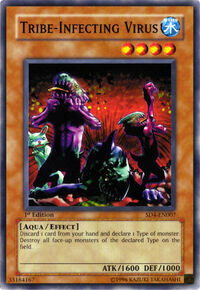 Tribe-Shocking Virus is a watered-down counterpart of this card. In Sangan's , the creatures in this card's artwork thought him to be cute, and playfully teased him. You declare the Type when you activate the effect and discard for the cost, not when the effect resolves, so your opponent can chain after you have announced which Type will be destroyed. You CAN declare a Type that exists only on your opponent's side of the field. You CANNOT declare a Type that is not face-up on the field at all. You can use this effect repeatedly as long as you can keep paying the cost. Lone Wolf: Your "Monk Fighter" targeted by "Lone Wolf" cannot be destroyed by the effect of "Tribe-Infecting Virus". Furthermore, if it is the only monster on your side of the field, your opponent cannot discard cards to activate "Tribe-Infecting Virus" to destroy Rock-Type monsters, because it will have no effect. My Body as a Shield: "My Body as a Shield" will negate cards such as"Tribe-Infecting Virus"
My Body as a Shield: "My Body as a Shield" can only be used against effects that will destroy monsters at that time. So you cannot use "My Body as a Shield" when "Tribe-Infecting Virus" is summoned; you can only use it in response to the activation of "Tribe-Infecting Virus"s effect, at which point the effect of "Tribe-Infecting Virus" is negated and "Tribe-Infecting Virus" is destroyed. .
Night Assailant: "Night Assailant" doesn't have to be sent to the Graveyard by an effect, or by an effect controlled by your opponent; it just has to be sent to the Graveyard. "Night Assailant"s effect activates when sent to the Graveyard as a cost for "Magic Jammer" or "Tribe-Infecting Virus"; "Night Assailant"s effect activates after the current chain resolves. Peten the Dark Clown: If "Peten the Dark Clown" is discarded as a cost for "Tribe-Infecting Virus" or "Raigeki Break", the last thing that happened was that those effects resolved, so the effect of "Peten" does not activate. The End of Anubis: When "Night Assailant" is discarded to activate the effect of "Tribe-Infecting Virus", and Fiend is named, the effect of "Night Assailant" is activated after "Tribe-Infecting Virus" resolves because "The End of Anubis" is no longer on the field.